Coaching up vital reserve with proven methods. Located just on the other side of the river from downtown, I'm here when you're ready to look and feel better. Private sessions tailored just for you are the best way to achieve the health you've wanted. If not now, when? Pilates is a mix of strength and mobility training that improves posture and overall fitness. With an efficiency that can be surprising, pilates trains the muscles to move more naturally which helps to create a longer, stronger, more balanced silhouette. Utilized by ballet dancers, athletes, and rehabilitation clinicians for years, pilates is the safest and most effective training method available. Still curious to know what it's all about? Sign up for a free 30 minute consultation. Wear clothes you can move in and we'll get you on the road to serious change! Don't leave anything on the table! There is more to being truly healthy than exercise. I help busy people optimize their nutrition, sleep, and other hidden stresses. As a certified Functional Diagnostic Nutrition Practitioner I can seek out the underlying causes that may be at the root of what is holding you back. Do you know how well you are digesting proteins and fats? How are your neurotransmitter levels? Do you know if you have any fungal or parasitic infections? These are just a few of the things that can cause food cravings, depression, skin problems, poor sleep, and so much more. These are the things that can stop you from getting the results you want. We can uncover them with at home lab testing and then create a protocol specially designed for you. Discount packages and à la carte lab testing available. CLICK HERE to schedule a free 30 minute consultation. Whether you are new to pilates, recovering from an injury or a professional athlete- I will work out a program to meet your needs. 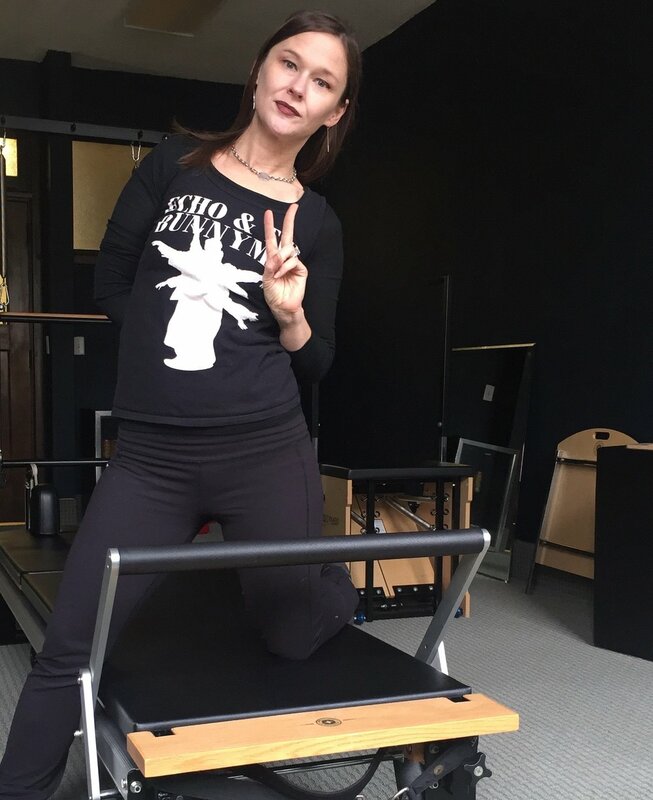 I am Stott certified trainer in mat, reformer, and stability chair pilates. I am also trained to work with those who suffer from injuries as well as pregnant and aging populations. Years ago I suffered from a herniated disk. I was overweight, over-tired, and definitely over the gym. Pilates ended up being a great option when my insurance covered rebab ran out. Something about the exercises gave me more energy and control of my movement than any other program I had tried in the past. Not that I was ever much of a group fitness type, but I loved the private attention and accountability of the reformer classes. I regained function of my back and lost the weight I had gained after the kids were born. My goal is to help people move more naturally so they can avoid injury and chronic pain. Our modern lives don't allow us the inputs our metabolism would like. Pilates is a great way to bridge that gap and either overcome injury or avoid it all together. Weight loss is often my clients #1 goal. Since becoming a pilates instructor I have been overwhelmed by the need to further help my clients get the body (and health) they desire. It is almost impossible to lose weight if you have inflammation or other health stressors. I've said that 80% of your weight is about what is on your plate. That's not true. Diet, rest, exercise and stress all play a roll in our very individual metabolic issues. For true health, a whole body approach is needed. I am very proud to be a Certified FDN Practitioner.